1.Tf7? a2 2.Tf1 Cc5! (2…h2 3.a7 Rb7 4.a8D+! Rxa8 5.Rb6) 3.a7 (3.Tc1 a1D+!) 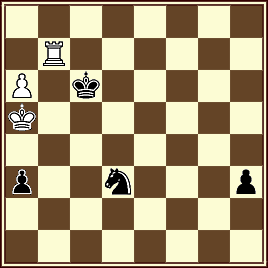 3…Rb7 4.Rb5 (4.Tf7+ Ra8 5.Rb6 Ca4+ 6.Ra6 Cc5+) 4…Ce6!